The T.K. Ramanathan award for the best tennis player of the year was presented to Prajnesh Gunneswaran at the recent Annual Day of the Tamil Nadu Tennis Association. This must have kindled nostalgic memories in TKR’s students who took the initiative to institute this award in the early nineties. The father of the legendary R Krishnan was known for his love for tennis and competition, old-world values, singlemindedness and innovative approach. TKR was first a tennis player and later became a coach. As a player, he excelled in regional tennis, reaching top ranking both in Madras Presidency and in Delhi in the 1930s and 1940s respectively. He was also ranked No. 7 at the national level. While in Delhi, he was so popular a tennis player that the Viceroy would send his car to pick him up for a game of tennis, much to the awe of the neighbourhood! After his seven-year stint in Delhi as a government servant, he returned in 1948 to his native Tenkasi where he focused on his son Krishnan who was showing great promise as a tennis player. 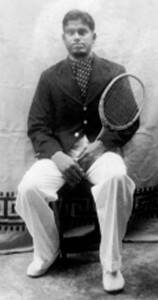 In 1950 he moved to Madras to further Krishnan’s education and tennis. He also built a house (Ram Nivas) to which he added a tennis court, and installed floodlights later (1954). According to Krishnan, his father was a self-taught player and coach. Bill (William) Tilden’s book “A-Z of Tennis” was his guiding light. It enabled him to develop his own game through intensive application and practice. He also brought into the game his theories based on physics and mathematics, which served to expand his range of shots and angled placements. “The shortest distance between two points is the straight line connecting them”. Using this axiom in tennis, he explained that the ball hit at the top of its bounce flat and firm with a short back-swing would travel faster to the disadvantage of the opponent. Both Krishnan and Ramesh Krishnan used this shot to their advantage even against top players. TKR laid emphasis on the combination of coaching, physical training and competition; used in the right proportion, they had a synergetic effect. Krishnan attributes all his early victories (he won the Stanley Cup as a school boy in 1950, the National Championship in January 1954 and the Wimbledon Junior Championship also in 1954) to his father’s coaching alone. His rapid rise thereafter came largely through competition. TKR also played a key role in shaping his grandson Ramesh to win the Wimbledon Junior Championship in 1979. His other grandson, Shankar also benefitted from his coaching to the point of playing for India in a Davis Cup tie. When Krishnan began to play in tournaments across the globe as a seasoned player, TKR had time to train others individually, both morning and evening at his house. His knowledge, experience and a fund of common sense, combined with strong communicative skills, made him a singularly effective coach. He was a hard taskmaster with a benign touch, which made the learning process thoroughly enjoyable. The author of this article was fortunate to be one of his trainees. Sir, as they addressed him, would stand on the middle service line a few feet away from the net, with a large basket containing around 50 balls which he fed to each and every trainee. The 30-minute workout covered all aspects of the game, including foot-work, back-swing, follow- through, economy of movement, etc., and was quite exhausting. Coaching was not however just sweat and toil, there were many light-hearted moments. On Sunday mornings, after the session, TKR took the trainees to Rayar Café in Kutcheri Road and treated them to exquisite idlis. When Krishnan’s letters came from abroad, TKR would read to the trainees the information on the tournaments in which Krishnan had participated, the players he had met and other tennis-related news. They also got to see the champion in action, interact with him and even play with him whenever he came home. Although cinema was not Sir’s cup of tea, as he felt it had a corrupting influence on youngsters, the trainees were thunderstruck when one fine afternoon, he organised a visit to the Globe cinema hall which was showing a popular Marilyn Monroe film. He quickly clarified that the visit was to see the Indian News Review which was showing excerpts of a tennis match between Krishnan and Prichant in the India-Belgium Davis Cup tie. As soon as the Review was over, the trainees, to their disappointment, were marched out of the theatre! TKR closely followed his trainees’ performance when they participated in tournaments. When they won, he was pleased and when they lost, he analysed the reasons for the defeat and outlined fresh strategies. The author as a Vivekananda College student was to play in the finals of the College tournament against his professor TB Balagopal, an effective and skilled veteran who was a well-known past champion of Madras Presidency. In the pre-match briefing, TKR advised his trainee not to fall into the trap of pitching his wits against the opponent, known for his spins and uncanny placements. “Don’t use your brains. Instead rely on your legs and return every ball so as to wear him out”. This ploy was indeed successful! Among the earliest trainees were (late) S Amrithalingam, and his brother SK Sundaramurthy, a keen participant in club, local and state tournaments. Lakshmi Mahadevan progressed to win the Asian, All-India Hard-Court and Ceylon Championships in 1963, achieving No. 1 ranking in women’s tennis. She continued to play competitive tennis for many more years, winning many laurels. Her sister Sharada played for Madras University. Leading industrialists of today, N Sankar and N Srinivasan combined to win the Erskine Cup as the best Doubles team in Madras University. Sankar continued to be a regular participant in City league and Club matches. His younger brother Kumar played for Madras University and continued to participate for many years in Club tournaments. The author himself won the Stanley Cup and the Erskine Cup, captained the Madras University and State teams and participated in many state and national tournaments in India, and also in Ceylon and Pakistan. Many of the trainees are keen tennis supporters today. TK Ramanathan passed away in 1990 at the age of 80, leaving behind a rich legacy. To perpetuate his memory, N Sankar, taking the lead, proposed that the trainees found an endowment named after their Coach. The corpus would be used to give an annual monetary award to the best player of the year, in consultation with Tamil Nadu Tennis Association. Later, for practical reasons, the corpus was transferred to the TNTA to be used for the same purpose.